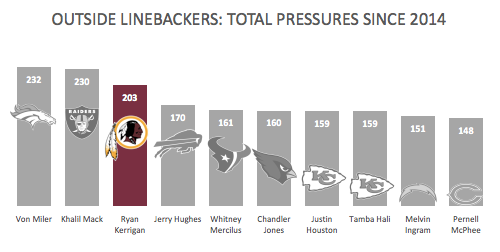 Since entering the league in 2011, Washington LB Ryan Kerrigan’s consistency has been a strength of the Washington defense. He has finished in the top 10 among outside linebackers for sacks in all but one season (and he finished 12th that year), Likewise, he has finished in the top 10 among outside linebackers for pass-rush productivity in all but one season. In 2016, he ranked fourth in pass-rush productivity and racked up 72 total pressures, ranking him third among his peers. He was the 10th-highest-graded 3-4 OLB, with a grade of 82.2. Since 2014, he has accumulated 203 total pressures. 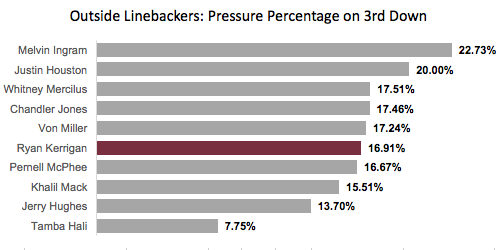 Von Miller and Khalil Mack are the only outside linebackers to create more. Since 2014, his 204 pressures rank him ninth among all edge defenders in the league. In 2016, he produced 23 pressures on 136 third-down pass-rush snaps. His third-down pass-rush productivity of 4.60 ranks seventh among outside linebackers and his pressure percentage of 16.91 percent on third-down pass-rushes ranks sixth.